After six long months of envy, North Americans can rest easy–we’re finally getting the small New Nintendo 3DS! Gamestop announced at their Managers Conference in Las Vegas that September 25 would see the release of a bundle including the New Nintendo 3DS. 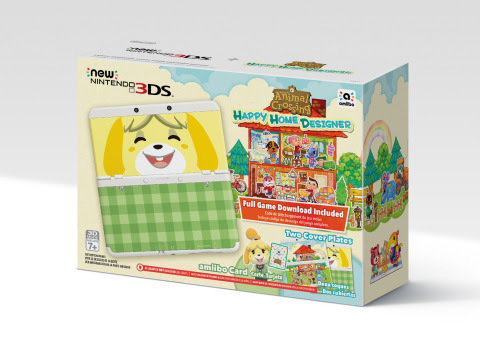 The bundle will feature a white New Nintendo 3DS with two sets of Animal Crossing-themed faceplates. The system will come pre-loaded with new game Animal Crossing: Happy Home Designer, and will also include an amiibo card. The bundle will sell at an MSRP of $219.99. Also announced was a new Legend of Zelda-themed New Nintendo 3DS XL. The Hyrule Edition New Nintendo 3DS XL will be gold-colored with a Hylian crest on the front. The system will launch exclusively at Gamestop on October 30 at an MSRP of $199.99. Three new Wii Remote Plus controllers were also announced. The controllers will be inspired by Yoshi, Toad, and Bowser. Each controller, exclusive to Gamestop, will have an MSRP of $39.99.